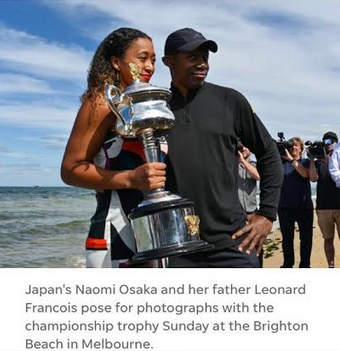 Led by a congratulatory tweet from the prime minister, Japan reveled in Naomi Osaka’s dramatic Australian Open win on Sunday. Osaka was born in Japan – her mother is Japanese, her father is Haitian – and she moved to New York at age 3. Osaka’s grandfather, who lives in the remote fishing village of Nemuro on Japan’s northernmost island of Hokkaido, said Sunday he was relieved. Beyond dignitaries and relatives, average fans took pride in Osaka’s win. “Osaka becomes first Japanese Australian Open champion, Heading to World No. 1,” read the headline of the Nikkansports online edition. Osaka’s results on the court and her quirky sense of humor have sent her popularity skyrocketing, and her list of endorsements now includes major brands like Adidas, Nissan, Yonex, Citizen, Nissin and Shiseido. Osaka’s victory at the U.S. Open was the first Grand Slam singles title by either a man or woman of Japanese nationality. On the men’s side, Kei Nishikori was runner-up at the 2014 U.S. Open, losing to Marin Cilic in the final. Osaka’s rise to the top of the tennis world couldn’t come at a better time. With the 2020 Tokyo Olympics just over a year away she could become the face of the Games.